With asparagus season finally on the horizon it is time to revisit some of our favorite asparagus recipes. 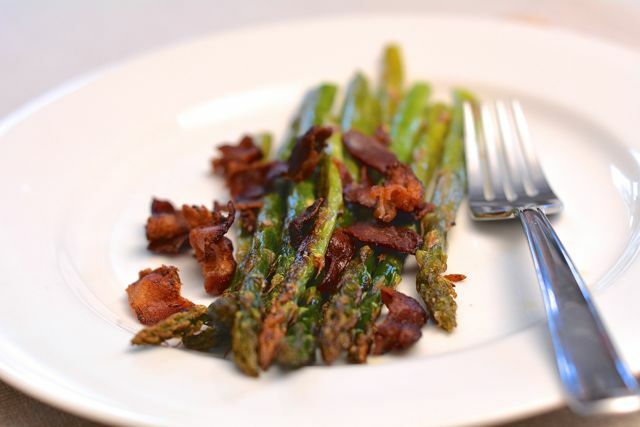 Cooking asparagus with bacon is one of my new favorite ways to prepare it. The salty meat pairs beautifully with the strongly flavored green stalks. The salt makes them sweeter and gives the whole dish a nice crunch. Making this dish is really quite easy and is perfect for spring entertaining. I recommend using the thick green stalks of asparagus when you make this. I think they have more flavor and roast more evenly than the thin variety. When the dish is ready be sure to serve it up warm to your guests. They’ll love the new twist on their favorite vegetable and gladly welcome spring! Step 1: Preheat the oven to 400 degrees F. Line a rimmed baking sheet with aluminum foil. Place the asparagus on the baking sheet and drizzle it with enough olive oil so that the asparagus is coated when tossed. This is usually about 1 or 2 tablespoons. Sprinkle the asparagus with a large pinch of salt. Roast the asparagus for 15 to 20 minutes, or until it is tender enough to be speared with a fork. Step 2: While the asparagus is roasting cook the bacon on the stove top and move to a paper towel lined plate to drain. Cut it into small pieces. Step 3: Once the asparagus is finished roasting move it to a serving platter and sprinkle with the bacon pieces. Serve warm.